The Keighley and Worth Valley Railway plays its part in recreating the period and this year the Railway will be providing a unique experience when, for first time in 2014, the Railway will be running a steam service hauled by two locomotives specifically designed for the World War 2 war effort – 90733, a British WD class 2-8-0 and the only survivor of this seminally important design, and former USA Army Transportation Corp S160 class 2-8-0 number 5820, whose re-entry into traffic after a substantial rebuild was only completed early this year. 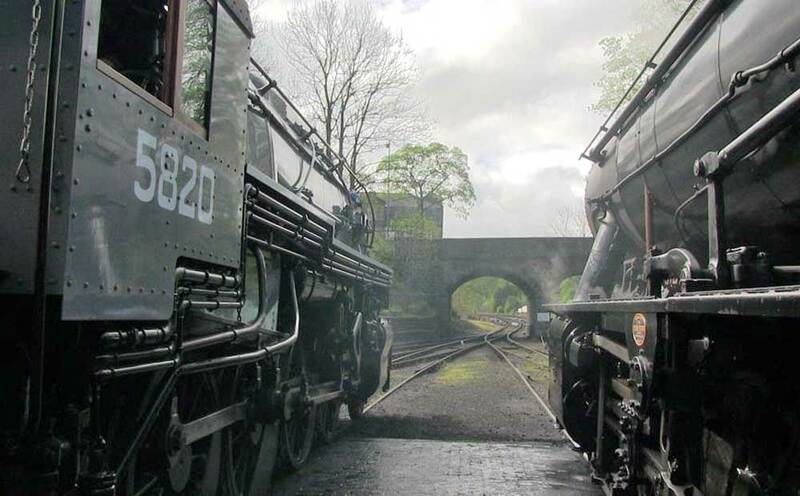 Before the event on Saturday morning, from about 9.30, the two World War 2 locomotives will be on display in Haworth Locomotive Yard and a small service of dedication and thanks will take place by the Rector of Haworth, the Rev. Peter Mayo Smith. The service will conclude with the departure of both engines into traffic at about 10.30. The public are encouraged to be present. Although access to the yard is likely to be restricted, an excellent view can be obtained next to the site, looking down onto it from the viewing area and Bridgehouse Road bridge. To mark this important return to service of this unique pairing of such important designs, present will be the U.S. Military Attaché to the UK, a senior British General and H.M. Deputy Lord-Lieutenant for West Yorkshire, Major Stan Hardy.